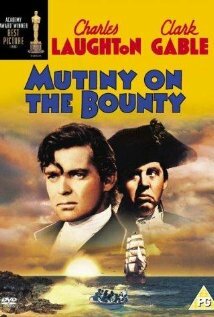 1935’s Mutiny on the Bounty was directed by Frank Lloyd and stars Clark Gable, Charles Laughton, and Charles Laughton’s eyebrows. It was based on the 1932 historical novel of the same name by Charles Nordhoff and James Norman Hall. The facts of the actual mutiny are comparatively unclear; while the ship’s captain wrote a lengthy account of the events, his version is inherently untrustworthy considering he was the one mutinied against. Perhaps it is not in his best interest to present the facts exactly as they were, considering that others allege that it was his extreme cruelty and lack of compassion that led the mutiny. The captain, for the record, attributes the mutiny to the men being swayed by the idyllic life in Tahiti and wanting to return there. Being a film adaptation of a fictionalized novel based on the actual mutiny, the events in this film are at a third-degree remove from any kind of reality. That gives the screenwriters more than enough artist license to do away with any gray area and write exactly the straightforward story they want to. The plot of the actual film is just about as simple as you can get (considering it’s the name of the movie). Follow me here: there’s a ship named the Bounty, and, wait for it… there’s a mutiny on it. In this particular movie adaptation, subtlety is not the first word that comes to mind. Captain Bligh (Charles Laughton) is so cruel as to be cartoonish: every minor infraction, real or imagined, is met with comically overreaching punishment. If he orders a punishment and the victim happens to die, well, serves them right. Woe unto those sailors who once contradicted him by having the nerve to tell the truth. This sets up a pretty classic Evil Villian for our dashing hero to rebel against, and boy is he dashing. As a comparative youngster who hasn’t seen as many classic movies as she’d like (that’s the whole point of this series, after all), it turns out, strangely enough, that Clark Gable really is charming as all get out. He is the veritable embodiment of charm and charisma and The American Way. I feel like I know what they’re talking about now when they say someone has a 1000-watt smile. Clark, I mean Christian, is compassionate and caring and can’t help but speak out against the Evil Captain Bligh. Mutiny is the very worst thing you can do on a ship in the Royal Navy, and so once the mutiny has taken place and Captain Bligh is set adrift in an open rowboat (with 18 of his sympathizers), the mutineers have no choice but to head back to Tahiti and settle in, since they can never go home to Britain. It’s a rough life, living in a tropical paradise, but someone’s got to do it. There is more that happens in the movie after that, for the record, but it would be spoilery to go into it. It’s a reasonably fun movie, because of/in spite of strength of its ideas about Right and Wrong. It’s fun to root for the good guy and against the bad guy, and it’s really fun to see Clark Gable looking dashing as hell. But it’s not like you need to rush out and see this one (like I would recommend you do with Grand Hotel, which looks way better for having seen this). If you want to watch an old-timey movie, you could do worse than this.